Hi, my name is Arcadius, and this is my story. I was born in a hoarders home. She had a lot of stuff piled everywhere, so there wasn't much room for the pets there, even before my brothers and I were born. As soon as I could walk, I was put in a cage. And left there- I guess they didn't want me walking around the dangerous piles of stuff. Sometimes I was fed and watered. Life was sad and grim, each day melted into the next as there was no breakup of the day. I was infected with fleas and itched so much that my for feel out in patches. We were rescued and I was placed in a rescue home. I was skittish at first, as I wasn't used to humans and being touched. But before long I was running and climbing and frolicking, and enjoying warn laps and full belly. Soon I was adopted by a lady who loves to travel! I got to see so much of the world! We're currently living in Paris. I get to enjoy the finest cheese- a temptation I've acquired, and have my own window perch to bask in the sun. 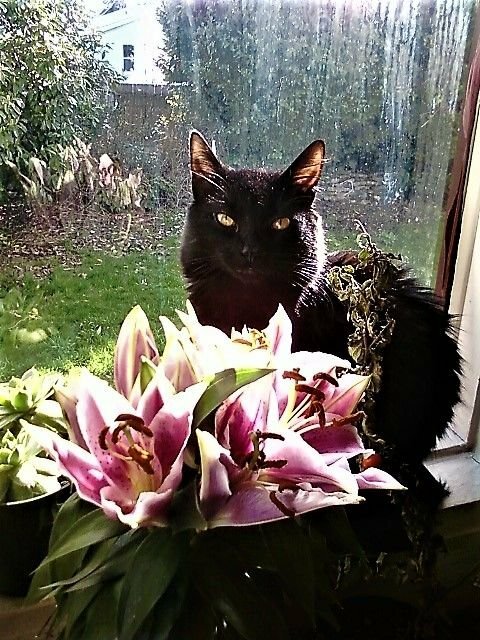 My name is Shadow, and I was left in a box in the woods with my littermates when I was just six weeks old. Thankfully, a kindly person heard our sad meowing and took the box to the local shelter... and now I have a safe and loving forever home!